After the speeches and congratulations, the ribbon is cut, and the doors are opened amongst cheers and balloons on a beautiful, sunny, and clear day in Paso Robles. LOVE IS IN THE AIR : Ken and Kris Siegal (left) stand with Maria Goldman in this newly opened wine bar and jewelry store. 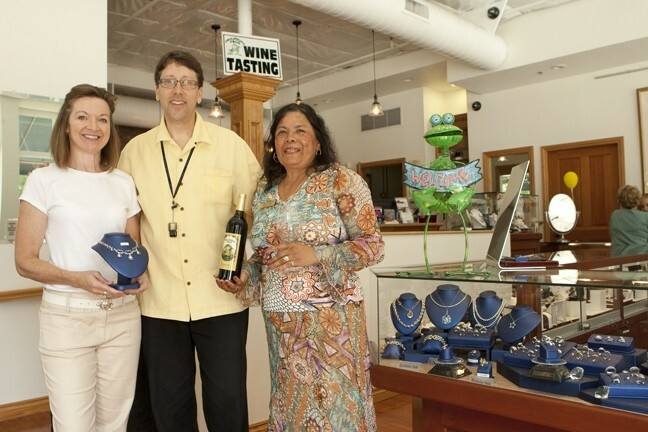 Siegel’s Jewelry, which features a tasting room with Frolicking Frog Cellars, has been open since the end of May, but the official ribbon cutting wasn’t until Aug. 16. The opening of Siegel’s was the end result of a serendipitous act, and being that it happened suddenly the store is still a “work in progress” as signs still need to be hung and showcases installed. Ken and Kris Siegel were celebrating their 25th wedding anniversary, as Ken says, “biking around Paso and going to the local wineries” when they came across the various pieces that make up a store: showcases for the jewelry and a place to sell them. The family business began in Cedar Rapids, but they found themselves wanting to buy a place in Paso Robles. Ken and Kris fell in love with Paso Robles because it had “a friendly, mid-western feel.” It reminded him of home in Cedar Rapids. They had found something they could build here. Since Stu was a goldsmith without a job, who happened to have the added ability of making wine, and Ken wanted to open a jewelry store on a site that already had a wine tasting room in it and needed a goldsmith, the pairing was a perfect fit. The Siegels get half their jewelry secondhand, from estate sales, people bringing items in, and bankruptcies. They take in what other people don’t need, don’t want, or can’t afford to hold on to, and they give it a new life, a new purpose, passing that item’s story on to you to renew it with life. Selling beautiful secondhand jewelry has the added benefit of keeping the prices down while still maintaining a high level of quality. The showroom is bright and open with sunlight glinting off the jewelry. The employees are smiling and happy. The showroom is below the wine tasting room, a dance floor set off from the bar. Upstairs you can try some of Frolicking Frog’s sweet, refreshing wines, talk to Stu and Maria and head down to Ken and Kris with a smile on your face and a bottle or two in your hand. Ken, Kris and the other friendly employees will help you find that perfect piece for that special someone. You’ll leave, swimming in the warm glow of togetherness, to stumble down the burning, lazy, and idyllic streets of Paso Robles, maybe stealing a kiss under the shade of the park across the street. All in a day’s work, two couples selling and creating what they love, together. Siegel’s and Frolicking Frog Cellars is located at 739 12th St., Paso Robles. You can reach Stu and Maria in the tasting room at 466-0779 and Ken and Kris in the showroom at 239-4367. The IRS has a new tool to help students spend less time filling out their FAFSA application. The IRS Data Retrieval Tool allows applicants to automatically transfer their required tax data from their federal tax return to their FAFSA. Visit IRS.gov for more information. Intern Kristofer Marsh compiled this week’s Strokes and Plugs. He can be reached at interns@newtimesslo.com.